Great, compact carrying and cycling bag with a fascinating shape. The strawberry red colour will attract attention and you will not go unnoticed while riding your bike or walking down the street. This beautiful addition is simply dotting the i to your styling. You can carry the bag on your shoulder or attach it to the handle bar using fitted velcro straps. This Mme Velo bag is equipped with two Velcro straps to attach to your handlebars so you no longer have to be worried your bag slips from your arm or falls out of your basket while riding. Both you and your bag are safe to ride around! Heels on Wheels! Mdme Velo is a brand for trendy, modern and demanding women who appreciate design but at the same time want to feel comfortable. Being trendy and active is not a restriction but a lifestyle. We know that well as this is who we are! The Basil Miles Double Bag is a waterproof double bag with a large capacity of 34 liter. 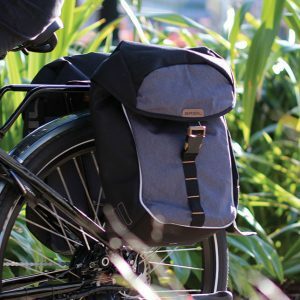 Grocery shopping or bike trip through the Ardennes, this pannier makes your bike ride easier and more fun. The dark gray / anthracite and brown details make the bag style. When it rains, the waterproof material ensures that the contents of the bag dry. 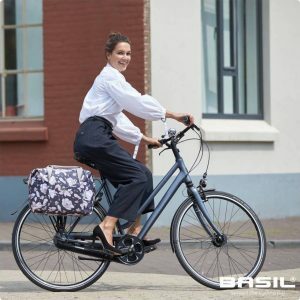 By Basil Universal Bridge System fits the bag on the luggage carrier (including e-bike) and can be combined with restraint as Racktime, Carry More and i-Rack. The reflective details help you to be more visible in the dark. There is also thought to mount for LED lighting. 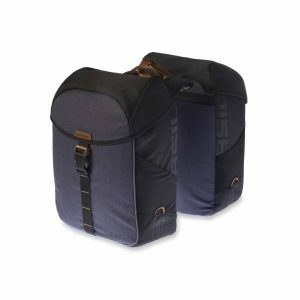 The double bag closes with the help of a roll closure and snap closure, and has a solid inner lining. 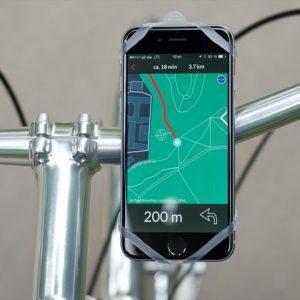 The universal smartphone mount for every bike. Made in Austria. With Finn you can safely and easily mount your smartphone to any handlebar. Thanks to its simple design and high quality material, the mount withstands whatever you throw at it. Every Finn comes with a voucher for a city in the Bike Citizens app. The Bike Citizens app uses the know-how of bike couriers. 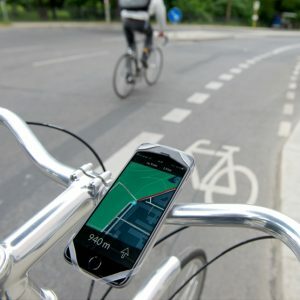 The bike app is specifically designed for the needs of cyclists in cities. It favours cycle paths and side streets and avoids busy main streets. Get the best routing across the city to make cycling even more comfortable and fun – discover the city from a new perspective! A simple design and waterproof pockets to protect your computer, your files and of course your Plixi. Designed primarily for modern cyclists like you, it assists you in your travel by simplifying your life. 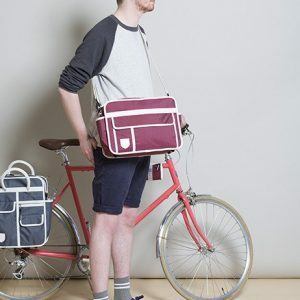 The Basil Bicycle Pannier Magnolia Carry All is a stylish choice of bicycle storage. 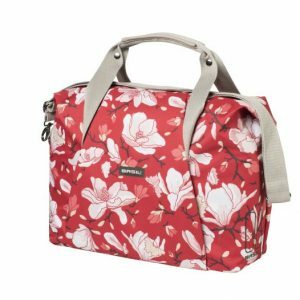 In vibrant red with a beautiful flower print, this bag makes the ideal companion to every bike ride. Make quick work of commutes into work and store your laptop and office essentials away neatly, or grab your school books and stationery and tuck them away safely until the ride to the classroom is done. This practical bag is incredibly resilient and attaches to your luggage carrier via the hook-on system with ease. Made from water-repellent polyester, it’ll withstand the elements and keep your contents dry. In addition, you’ll get a rain cover with your purchase, furthermore helping keep precious belongings dry as a bone. In addition to this, secure zip fastening and inner linings keep everything in place. Additional hinge handles and shoulder straps mean this bag can be kept with you at all times, ideal if you need something that can stay with you long after the bicycle journey is done, or if you’re worried about security of your accessories. With a capacity of 18 litres, there’s plenty of room on offer here. An attractive choice at an even more attractive price, the Basil Magnolia Carry All Bag is bound to become a firm favourite.